Modern dance is a dance form developed in the early 20th century. Although the term Modern dances has also been applied to a category of 20th century ballroom dances, Modern dance as a term usually refers to 20th century concert dance. Generally mentioned in this category are Loie Fuller, Isadora Duncan, Martha Graham, Merce Cunningham and Pina Bausch. In the early 1900s a few dancers in Europe started to rebel against the rigid constraints of Classical Ballet. Shedding classical ballet technique, costume and shoes these early modern dance pioneers practiced free dance. 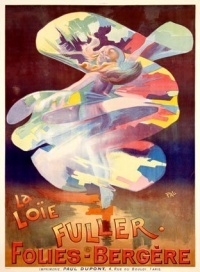 In America Loie Fuller, Isadora Duncan, Ruth St. Denis, Doris Humphrey and Martha Graham developed their own styles of free dance and laid the foundations of American modern dance with their choreography and teaching. In Europe Francois Delsarte, Émile Jaques-Dalcroze and Rudolf von Laban developed theories of human movement and expression, and methods of instruction that led to the development of European modern and Expressionist dance. Their theories and techniques spread well beyond Europe to influence the development of modern dance and theatre via their students and disciples, and subsequent generations of teachers and performers carried these theories and methods to Russia, the United States and Canada, the UK, Australia and New Zealand. Typically, Modern Dance has now been categorised further. In Europe in particular, early modern dance or free movement dance is now classified as Contemporary Dance, a genre that encompasses the work of Rudolf Laban, Merce Cunningham, Martha Graham . Whilst those studying Contemporary Dance learn a technical subject as for anything else, the choreography seen in performance is very diverse and generally can not be recognised as any specific dance style, although other dance styles can often influence much of the movement. The term Modern Dance today, is typified as being the style of theatrical dance seen in the period between the 1970s and 1980s. With a strong classical ballet influence, in its purest technical sense, the movement is generally very fluid and balletic, although it does include the dynamic highlights and tricks of jazz dance, with isolations, kicks and leaps. Many movements are very weighted and to the earth. This has led to it being given the name Classical Jazz, in many countries. As the field of Modern Dance has developed and other dance genres have become more defined, the term Modern Dance has become almost obsolete. Now, most styles once seen as Modern Dance are normally classified as being either Contemporary Dance, Jazz Dance or sometimes, Classical Jazz or Modern Jazz. Unless indicated otherwise, the text in this article is either based on Wikipedia article "Modern dance" or another language Wikipedia page thereof used under the terms of the GNU Free Documentation License; or on original research by Jahsonic and friends. See Art and Popular Culture's copyright notice. This page was last modified 20:56, 30 June 2009. This page has been accessed 4,756 times.